A good soldering iron is never wrong. You can go with just a soldering iron or one that you can control (although those are generally more expensive. I myself have both. One that I can control the heat of and one where I can’t. For a good soldering iron, I recommend Weller, for beginners, although when you are more experienced, you can go with more expensive options (but it’s not necesarry). I heard you smack your head. Off course you need solder. 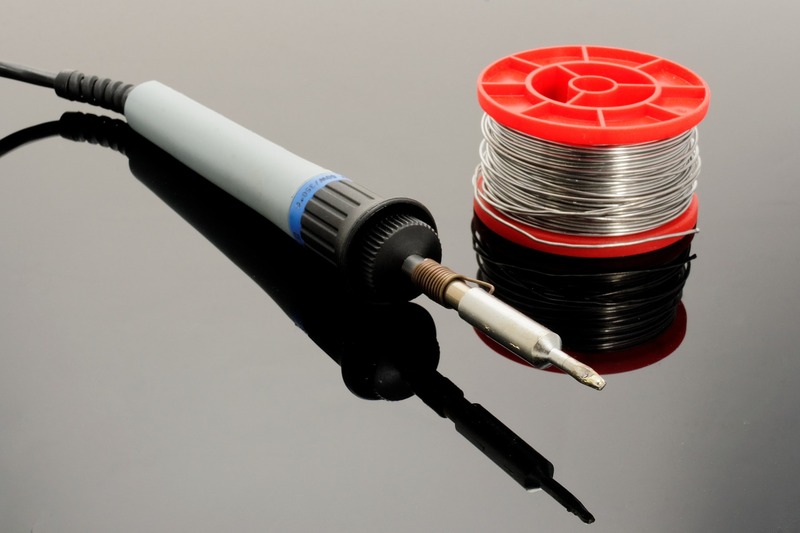 In Europe, solder with lead is illegal, so there is no lead poisoning here, although to be on the safe side, always solder in a wel ventilated area. In other parts of the world they do sell solder with lead, although easier to work with, it is toxic (the lead in the solder is not good for you), so be carefull. I recommend using solder without lead. This is a duh! moment, but once I start explaining it, it won’t be so obvious. I have thought about this. Where are you going to solder? Do you have a dedicated area for it that is fireproof (or at least heat resistant)? I don’t have this dedicated area, so I had to go look for another option. A ceramic tile is an option, as these are heat-resistant and fireproof. Another option is those materials used to set bunsen-burners on. Those are available through ebay (if you want them cheap). A third option (and the one I went for) is an ESD-mat, used to work with electronics (so also heat resistant up to a certain temperature for soldlering). Very cheaply available through ebay. I don’t think you are able to hold the thing you need to solder, your soldering iron and the solder while soldering, so this one is obvious a necessity. You can go for more expensive models, but you can get one as cheap as 7 euro on ebay. Although some soldering irons come with a small sponge to clean your tip, I don’t have to tell you that heat and water don’t mix that well. This is why to keep your tip in optimal condition, it is better to clean your tool with a metal sponge (with tool I mean your soldering iron, not the other thing), you can buy those ready to go for 15 euro, but you can also just buy a metal sponge used to clean out pots for 2 euro for 6 and cut a hole in an empty soda can to keep it in, so you have a means to clean your tip in a cheap manner that is also good for your tip. Only if you are going to desolder things from electronics (or maybe to resolder your own mistakes, you will need a solder sucker. I was able to find one for 2 euro on ebay. Although I can’t compare the quailty with other solder suckers this one works perfectly.